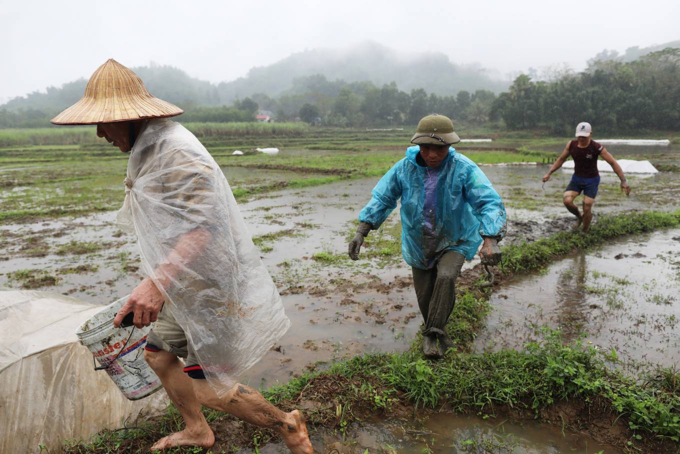 Winter days turn rice farmers into fishemen in Kien Tho commune, central Thanh Hoa Province, 150km south of Hanoi. Plowed fields and heavy rain result in water-logged sections ideal for eel “fishing” aka digging. 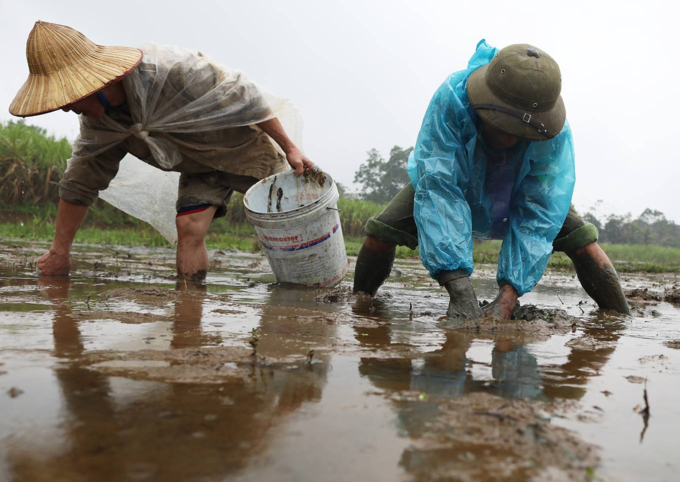 The farmers-turned-fishermen dig in the mud for eels and put them in a bucket. The ideal time to dig for eels is right before cultivating a new crop. Eels are to be found under 30cm of mud. The catcher looks for places where three to four holes are found at one place and where the mud has an opaque shade to locate eel nests. “When the eels are caught, people often use the middle finger to grip the eel’s body and lock it so it cannot move. 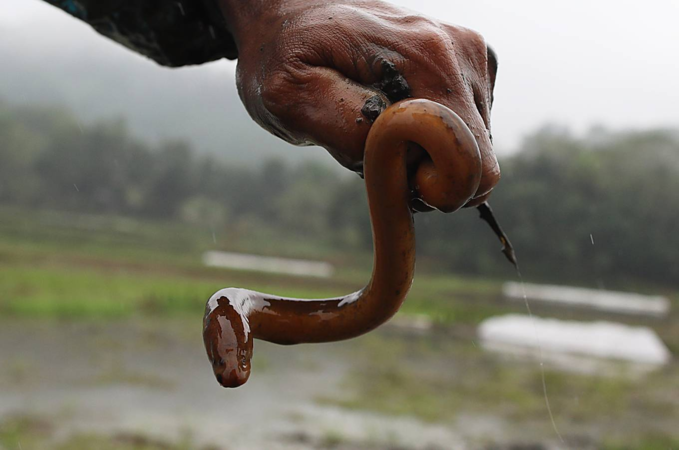 If the eel is too strong and fast, then grab its tail and press your finger on it,” said Pham Van Thanh. Thanh has 17 years of eel fishing under his belt. Large eels often live on the edge of the field because the location provides plenty of food and is ideal for laying eggs. “After locating the nest, we stick our fingers down the hole to get a sense of the path while the other hand flattens the surface mud layer. The eels will crawl away very quickly, so we have to use our feet to stomp on the ground very hard to block them from running. 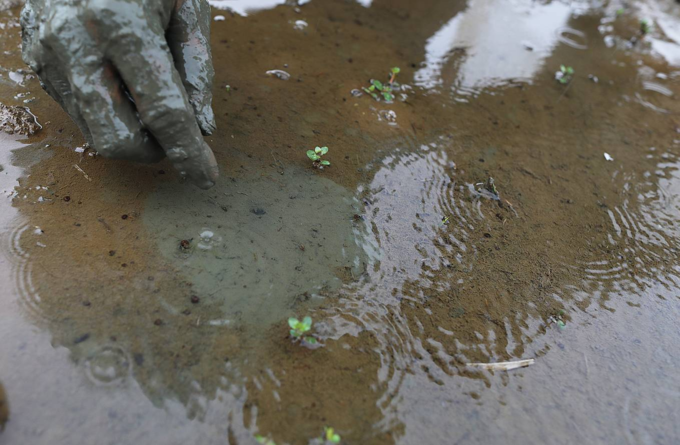 This frightens them and causes them to turn around and emerge from the mud,” said Thanh. Farmers locate an eel nest in the middle of a field. Eel nests located at the center of the field usually offer easier catches than those at the edge, because the latter are small and the eels are not as developed. 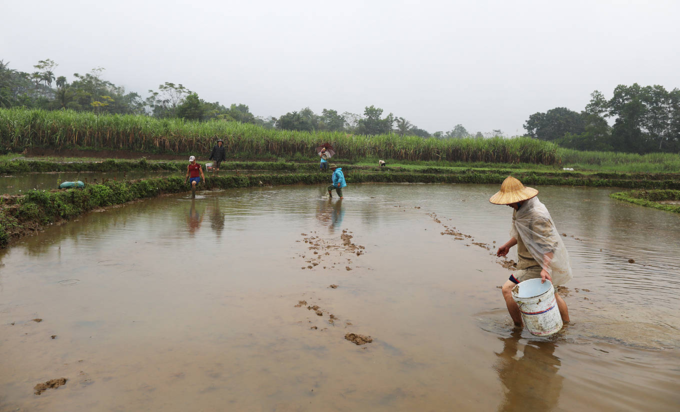 Eel fishermen in rice fields need a sharp eye and quick hands. 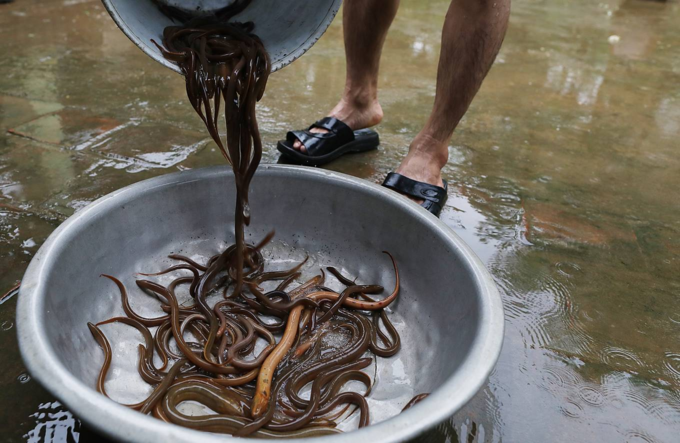 “Before, we could catch up to 400g eels, but now, because many people are doing this plus the rice fields are toxic with pesticides, the number and size of eels have drop significantly. An eel weighs less than 100g now,” Thanh said. Field eels are usually yellowish in colour with soft, firm meat. Every eel outing fetches a catch of about three kilograms. Field eels are a specialty of this region. A part of each catch is used for daily meals, the remaining are sold at VND100,000 to VND120,000 per kg ($4.3 – 5.2).